There are new puppy pictures in our gallery! For pictures click here. Puppies first week of life is behind us. They all weight over 1 kg, sleeping and eating all the time. Here is small slideshow video of their first week of life. Sika's hips and elbows results came today and she is hip and elbow dysplasia free! Also, Sika got her breeding certificate today. On a CACIB Zagreb show 21.11.2009. our Bura got CAC in open class females, judged by Hans Bierwolf and now she is a CROATIAN CHAMPION! Our Sika Vala Liburna won two r.CAC titles in intermediate class on both CACIB Zagreb shows (21. - 22.11.2009. ), second day judged by Nenad Andrić. 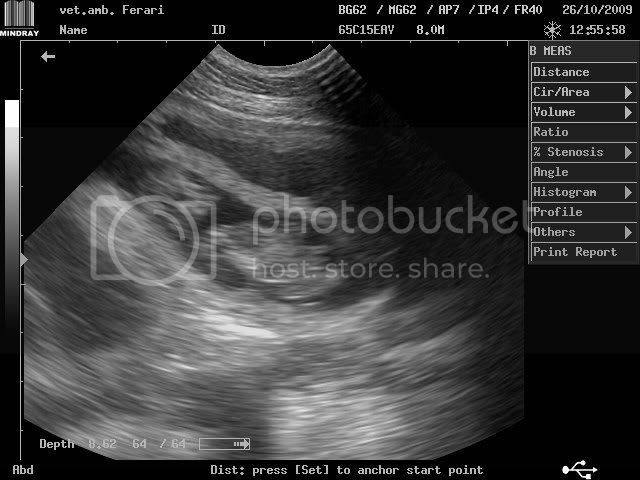 Ultrasound of Lyra's babies 36th day of pregnancy.For more info click here. In a special show for 1st and 2nd FCI groups held in Strib, Denmark, our Svid Vala Liburna owned by Ina Olsen and judged by Lidija Okleščen from Slovenia won CAC, BOB and 3rd place in junior Best in show. Congratulations Ina and Svid! 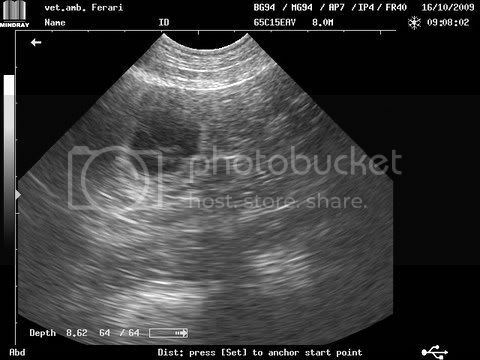 Lyra's pregnancy is confirmed today by ultrasound so we can officially announce a new litter around 21st of November 2009. For more info click here. We're back from World dog show in Bratislava (10.10.2009) where Sjever was excellent 2. in youth class, and from CAC Bratislava (09.10.2009.) where he got Young Dog Winner (CAJC) and BOB. New web design is online together with litter announcements. We hope for a successful winter in Vala Liburna kennel. » At the end of November we expect a litter from combination Roni (Hafiz) and Kanga (Lyra). For more info click here. 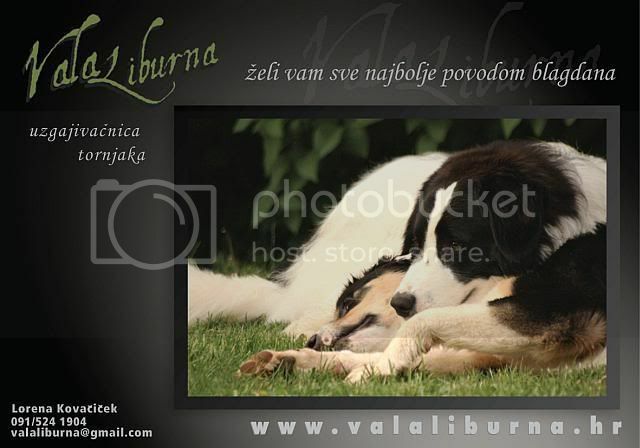 » At the beginning of 2010. we plan a litter from combination Sjever Vala Liburna and Koma (Bura). For more info click here. Vala Liburna kennel proudly announces that DNA profiles of our dogs are made in private laboratory Genos d.o.o. (www.genos.hr) from Zagreb. Thanks to DNA profiles of our dogs parenthood of their progeny can be tested. Sjever's hips and elbows results came today and she is hip and elbow dysplasia free! We got the same news for Svid! Silba's hips and elbows results came today and she is hip and elbow dysplasia free! Svid, Sika, Sjever, Suton and Silba we wish happy birthday to all of you and many more happy and healthy years with your owners! With this result Sjever got his place as one of 4 tornjaks in the Croatian kennel club "team" of Croatian national breeds representatives on World dog show in Bratislava. Sjever and Bura were the best couple in the show. KK Tornjak Tomislavgrad was great host of the show, but their biggest success was bringing mobile rtg machine and experts from Faculty of veterinary medicine from Zagreb. Thanks to that around 40 tornjaks were x-rayed for testing hip dysplasia. Breeding permissions were given by fra Petar Krasić. For more special tornjak show pictures click here. Another great weekend is behind us.We were on two CACIB Umag shows with Silba and Sjever. Here are the results. Sjever also got in the narrow selection of 7 dogs for BOG of FCI II. With this results Sjever became Young Croatian champion in the age of exactly 10 months. Two exciting weekends are behind us.We were on three shows - Special tornjak show in Zagreb and two CACIB Zadar shows. With this results Lyra became Croatian champion. On CAC Rovinj judge Vibor Ježek gave Young Dog Winner title to Sjever, and CAC titles to both Lyra and Bura. Bura and Lyra took part in CACIB Zagreb shows last weekend. Judges Jaroslav Matyas and Zlatko Kraljić judged Bura with CAC title which means she "opened" croatian championship, and Lyra got r.CAC. For other tornjak results click here.